Currently 10GbE and 40GbE network are efficient and enough for some users. However, to some large-scale data centres, 40GbE Internet speed can’t meet their demands as the Internet continues to grow in size and traffic. According to research predicts, global data centre Internet protocol traffic will grow by 31% every year within next five years. So 100GbE technology will become the mainstream in the near future. Cisco, Juniper, Arista provide 100GbE switches, routers and supported QSFP28 transceiver, QSFP28 AOC. But many enterprises still can’t upgrade to 100GbE network since the switch and QSFP28 AOC are quite expensive. Don’t worry about the high cost. This article will help you find a way to spend less on building 100GbE network with QSFP28 AOC. 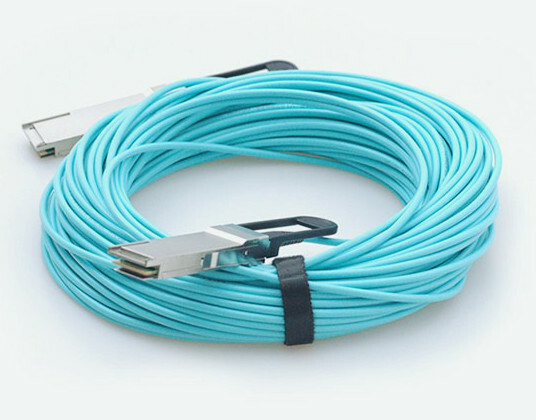 100GbE QSFP28 AOC is composed of an OM4 multimode cable connecting two QSFP28 connectors on each end. The form factor design is easy for plugging and removal. The QSFP28 AOC is compliant to the QSFP MSA (multi-source agreement). QSFP28 AOCs support 100G QSFP28 standards and are available in various lengths (usually from 1-30 metres). 100G QSFP28 AOCs provide an affordable low-power alternative to interconnect 100G QSFP28 ports in data centre applications. It’s useful for simplified intra rack and inter rack configurations. 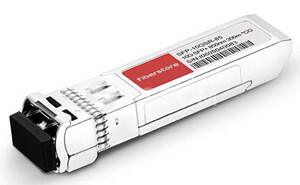 The following table lists 100GbE QSFP28 AOC of several famous brands. Cisco, Arista, Juniper are three famous fibre optic transceiver manufactures. Transceiver modules and switches of these brands are very common in the market. As the demand for 100GbE data centre keeps moving, these manufactures produce switches including 100GbE QSFP28 ports. Here I list four switches which can support QSFP28 AOC, Cisco Nexus 3232C, Arista 7500R, Juniper QFX5110 and FS.COM S5850-48S2Q4C. Cisco Nexus 3232C—The Cisco Nexus 3232C switch is a low latency, dense, high-performance 100GbE switch designed for data centre. It can not only meet customers’ current network needs but also suitable for future applications such as big data, cloud and virtualization. Each of 32 100GbE QSFP28 ports can operate at 10, 25, 40, 50, 100 GbE. Arista 7500R—Arista 7500R switches (7500R-36CQ, 7500R-36Q, 7500R-48S2CQ) is designed to lower power per 100GbE port and produce more reliable and dense network. The switches are available in a compact system design of 12, 8 and 4 slot. 7500R-36CQ has 36-port 100GbE QSFP line card. 7500R-36 owns 1/10GbE line card with two 100GbE QSFP28 ports. 7500R-48S2CQ is available with up to 6 100GbE QSFP28 ports. Juniper QFX5110—Juniper provides two switches with 100GbE port: QFX5110-48S and QFX5110-32Q. QFX5110-48S is a 10GbE/100GbE data centre access switch offering 48x10GbE SFP+ port and 4x100GbE QSFP28 ports. QFX5110-32Q offers up to 32x40GbE QSFP+ ports, or 20x40GbE QSFP+and 4x QSFP28 ports. FS.COM offers two switches for 100GbE network: S5850-48S2Q4C and S8050-20Q4C. S5850-48S2Q4C provides 48x10GbE SFP+ ports, 2x40GbE QSFP+ ports and 4x100GbE QSFP28 ports. S8050-20Q4C has 2x40GbE QSFP+ ports and 4x100GbE QSFP28 ports. Based on Table 1 and Table 2, to build a 100GbE network with QSFP28 AOC will cost a lot, especially when you require for products from Cisco, Arista and Juniper manufacturers. By comparison, you can see the price of FS.COM switches for 100GbE network and QSFP28 AOC is quite lower. So FS.COM can help you spend less on building 100GbE network with QSFP28 AOC. But if you have already owned Cisco, Arista or Juniper switches, you can buy compatible QSFP28 AOCs which are more cost-effective and have been tested to assure 100% compatibility. This entry was posted in Direct Attach Cable, Fiber Optic Transceivers and tagged 100GbE QSFP28, QSFP28 AOC on March 27, 2017 by laura.